If you not heard today is free Comic Book Day. Some of the tiles maybe out of stock by now. Have learned that lesson year I head out early around 8:00am. The store opens at 9:00am. I still did some quick contacts with my hand held on one of the ham radio repeater while I waited. 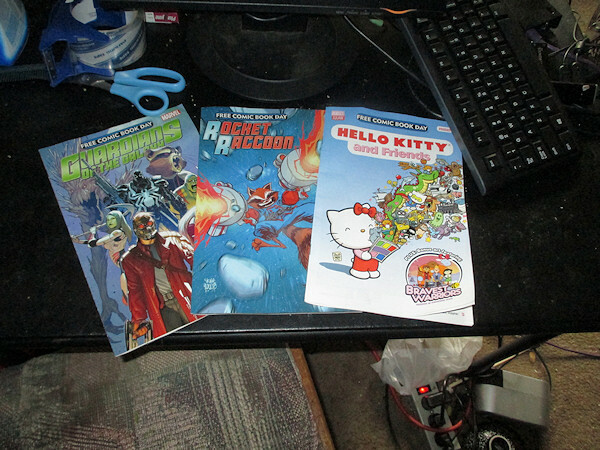 I got the two titles I was looking for, Hello Kitty and Friends and Rocket Raccoon. I picked up a copy of Guardians of the Galaxy because I am interested in the movie. I wanted to do some shopping and pick up some secondary choices but deiced it was getting too crowded. I will swing back latter. This entry was posted in Furry, Uncategorized by actonrf. Bookmark the permalink.